One of my favourite Adventure Time episodes is Loyalty to the King where the Ice King (after having his captured princess “taken away” by Finn and Jake) becomes depressed and eventually decides to shave off his beard and get in shape. The drastic makeover ends up attracting princesses who unknowingly refer to him as the Nice King. But deep down he is still the Ice King, a misunderstood and sad individual, searching for a princess to kidnap and marry. In a way I feel bad for him because he really just wants people to like him. 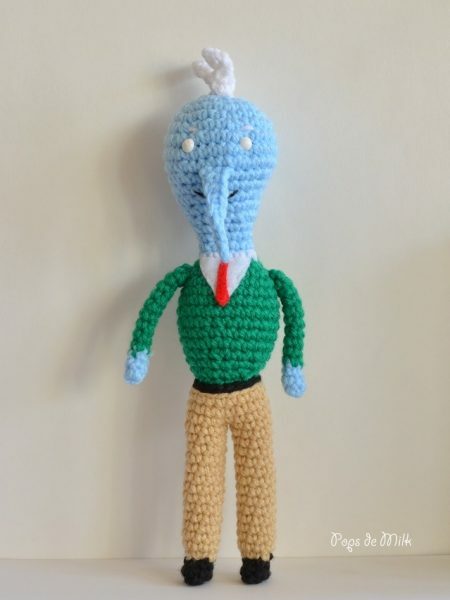 For a while I’d been wanting to make the Ice King but after seeing Loyalty to the King I was inspired to design a doll that could change from one character to another. This particular pattern took me a while to work on. It was a bit of a challenge figuring out how to make a removable robe as I’d never made anything like it before. Also, getting the eyebrows “just right” definitely tested my embroidery skills – I really wanted his expression to change from mean to nice by only adding/removing the beard. And let’s not even talk about the beard and hair piece yet! 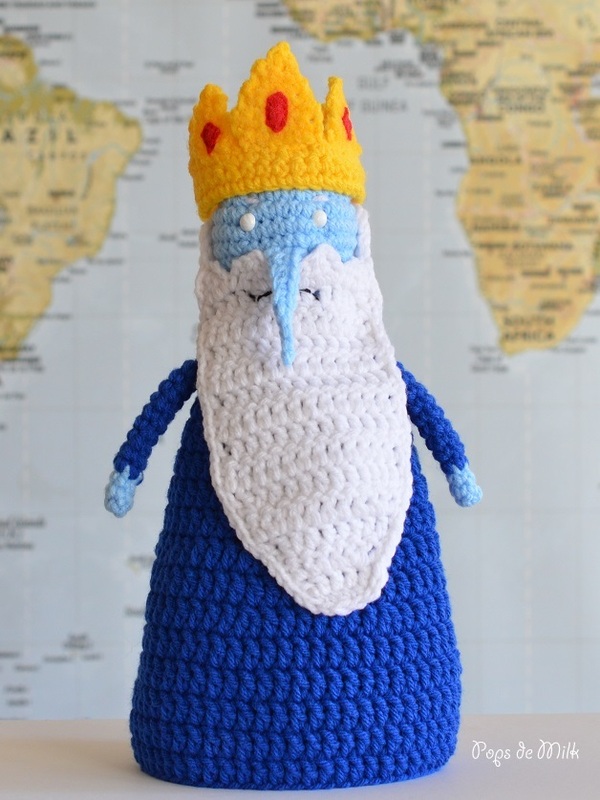 If you’d like to make the Ice (and Nice) King you can purchase the PDF in my shop or find the pattern below. *Pattern Update June 25, 2015* There was a typo in Round 23 of main body, PDF has been adjusted. Worsted weight yarn such as: Bernat – Sky, White, Kelly Green, Tan, Royal Blue, Black, and Yellow. 7mm safety eyes that have been painted white. Black embroidery thread and needle. Scrap piece of white and red felt. Tapestry needle for joining parts. Needle and thread in white and red for sewing felt pieces. Notes: Unless otherwise stated, this pattern is worked in continuous rounds using stitch markers to locate the beginning/end of a round. Work in somewhat tight stitches. Colour change happens when you have two loops on hook, finish stitch by pulling through loops with new yarn. Attach eyes (between rounds 7 and 8, 3-4 stitches apart) and begin to stuff head. Switch to Kelly Green yarn. Fasten off and leave long tail for sewing to pants. Begin sc and use new yarn to pull through and complete st.
Rounds 5-18: sc around. For the first leg sc in first 2 sts and fasten off. For the second leg make only 7 sc sts in the last round and do not fasten off. Align legs so the leg with the working yarn has the loop next to what would be the next stitch in the fastened off leg. Use a bit of scrap yarn to sew gap closed. Switch to Black yarn in last st of round 21. Round 22: sl st in BLO and fasten off. For a dc dec, start a dc but do not finish, start another dc in next st and once you have 3 loop on hook, yarn over and pull through all loops to complete dec.
Rounds 2-6: ch 2 (counts as first dc), dc around, sl st to join. Make sure head/body fit through hole. 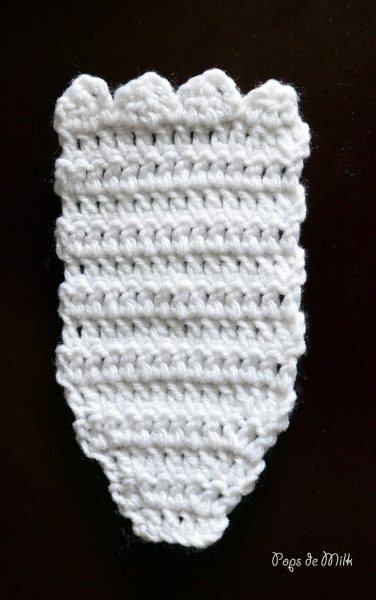 Remove hook and pull yarn so it makes a loop big enough for the button you’re using. Fasten off and secure loop by weaving and tying a knot. Switch to Royal Blue yarn. Ch 10, sl st in 2 nd ch from hook and next 2 ch, sc in next 3 ch, hdc in next 3 ch. Round 14: *ch 2, 3 dc dec, ch 4, sl st in same space as 3 rd dc in dec st* repeat to end to create 4 points. For a 3dc dec, follow same instructions as dc dec just add a 3 rd dc. Continuing along edge of piece, make 4 evenly spaced sl sts. Take the beard piece and align the top edge with hair edge where hook is positioned and join with 5 evenly spaced sl sts. Next, working only on hair piece, continue to sl st along edge and at the bottom of foundation ch make sl st, sc, hdc, dc, hdc, sc, sl st, then continue to sl st along edge toward top of hair piece. Join opposite side of beard piece the same way as before and end with 4 evenly spaced sl sts on hair piece edge. Fasten off and weave ends. Working with beard piece, pick up a sl st in space next to where the join left off and continue to sl st along edge in same fashion as hair piece. Fasten off and weave ends. Alternatively, you can sl st along edge and then attach hair and beard by sewing together. in 2 nd and 3 rd ch, sc in next 2 ch. Fasten off and leave tail for sewing to top of head. Fasten off and leave long tail for sewing triangles and ends together. Round 7: ch 1, sl st. Round 6: ch 1, sl st.
Join torso and legs by sewing behind the slip stitch round to give more definition. Option to stuff legs or add pipe cleaner/wire to make them bendable. Sew nose to face and embroider a smile underneath. Cut out jewel shapes with red felt and sew on to two of the small triangles and one big triangle. I did a Google image search of the Ice King to help me with the jewel shapes and location. With crown base yarn tail, sew the triangles along base and then sew the seams closed. 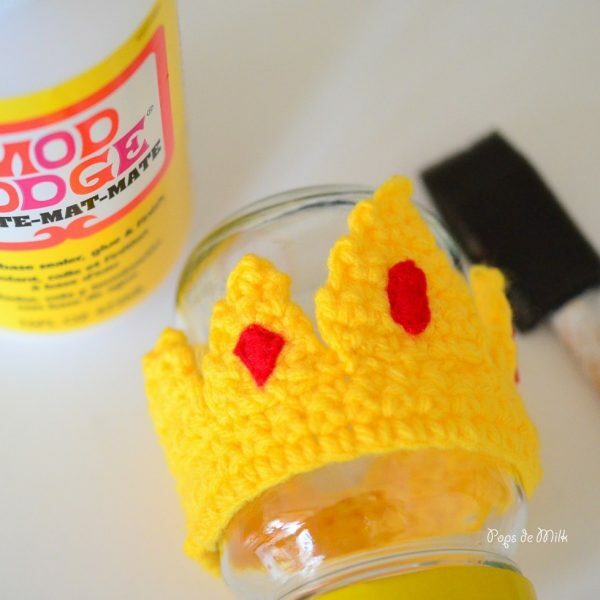 Use Mod Podge to help hold the crown’s shape. I used a glass jar to hold the crown while I applied an even layer of glue to the triangle portion only – this will still allow flexibility in the base. 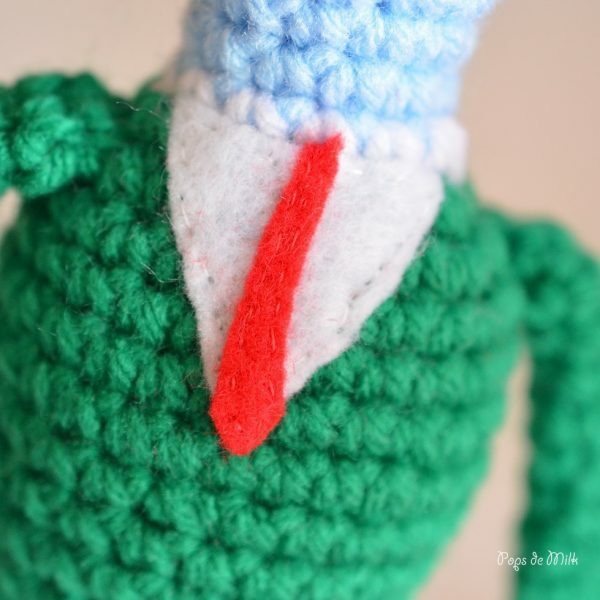 Use scrap pieces of white and red felt to make the shirt and tie piece. Note that the white piece is slightly curved so it aligns to the round shape of the body. Add any other fun embellishments and you’re done! If you have any questions or need clarification please contact me by email at popsdemilk@gmail.com . That is so cool! What a big difference losing that beard makes! 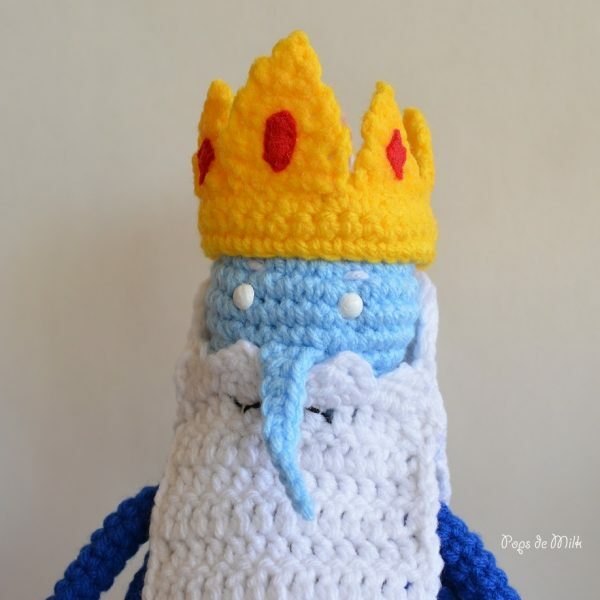 I like the ice king! Thanks for share this pattern! I love your jobs! Adventure time it’s the best cartoons!! !